Muir of Ord (Scottish Gaelic: Am Blàr Dubh) is a village in Highland, Scotland. 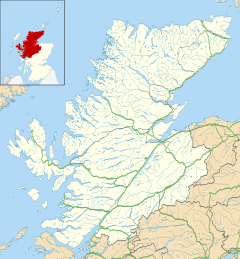 It is situated near the western boundary of the Black Isle, about 9 miles (14 km) west of the city of Inverness and 5 1⁄2 miles (9 km) south of Dingwall. The village has a population of 2,690 and sits 35 metres (115 ft) above sea level. Named Tarradale until 1862, historically access to the village was limited by the natural obstacles of the River Beauly and the River Conon. This changed in 1814 with the construction of the Conon Bridge. Cattle drivers used the new routes to transport livestock and markets were set up in 1820 close to where the village now lies. In 1835 whisky distilling operations were legally granted in the village and by 1885 the Mill of Ord produced 80,000 imperial gallons (360,000 l) per year. The village grew extensively in the 19th century due to the establishment of the distillery and goods industries. Also known as the Muir of Ord Fort, it is a Neolithic or Bronze-age henge and national monument of Scotland situated 300 yards (270 m) from Muir of Ord railway station. Today it is situated on the green of the Muir of Ord golf course. The henge measures 85 by 65 feet (26 by 20 m) and is surrounded by an 18 ft (5.5 m) wide ditch which is 4 ft (1.2 m) deep. There also are two standing stones about 3⁄4 mile (1.2 km) away from the henge. Just outside of the centre of the village is the Glen Ord Distillery, one of the few remaining whisky distilleries on the Black Isle. The Black Isle Show, one of the largest agricultural shows in Scotland, is held every August in a showground near Muir of Ord. The showground is a popular exhibition site thanks to the surrounding flower fields. Muir of Ord used to have a local football team in the 2000's, Muir of Ord Rovers F.C., that competed in the North Caledonian Football League. The major route of the A9 road passed through the village until 1982, when it was bypassed by the Kessock Bridge. The village is served by Muir of Ord railway station, which is on the Kyle of Lochalsh Line and the Far North Line between Dingwall and Inverness. ^ a b "Muir of Ord (Highland, Scotland, United Kingdom) - Population Statistics, Charts, Map, Location, Weather and Web Information". www.citypopulation.de. Retrieved 19 April 2019. ^ a b OS Explorer map: 432: Black Isle (Map). Ordnance Survey. ^ a b "Muir of Ord". Undiscovered Scotland. Retrieved 2 September 2018. ^ a b "Muir of Ord Drovers Football Club". Ambaile, Highland history and culture. 2004. ^ a b "Our 13th Green - Castle Hill Henge A Scheduled National Monument" (PDF). muirofordgolfclub.co.uk. March 2018. ^ "Castle Hill, Muir Of Ord". Canmore.org. Retrieved 2 September 2018. ^ Brocklehurst, Steven (6 March 2014). "Life and death on the A9". BBC News (Scotland - Highlands & Islands). ^ Brailsford 2017, map 18C. This page was last edited on 19 April 2019, at 22:22 (UTC).